Independent waste management group CSG has announced its latest acquisition – its second this year and the seventh in the past three years. The Fareham-headquartered company has purchased Frogson Waste Management Ltd, a family-owned business founded in 1983 and based in Sheffield from where it operates nationwide and offers industrial waste treatment, recovery, recycling, re-use and disposal services. Its annual turnover is around £3million. CSG managing director Neil Richards said Frogson’s would continue to trade as a separate company under the CSG group umbrella. He confirmed that all 20 Frogson employees would be joining the CSG workforce, and current manager Paul Wilson, who has managed the business for eight years, will take on the role of site manager. Frogson’s one-acre freehold site in central Sheffield has undergone major development work in the last few years and its facilities include a reverse osmosis ultra-filtration system for recovery of waste effluent and waste soluble oils – a sector in which CSG has been steadily expanding its business through acquisition and investment in technology. Earlier this year, CSG acquired Recyc-Oil Ltd., the Middlesbrough-based oily liquid waste processor operating mainly in the marine sector. CSG’s expansion activity, which has seen it make business acquisitions on an almost yearly basis over the past decade, means the group now has a presence throughout England and Wales with an estate of 26 operating sites, including its flagship hazardous waste treatment facility at Cadishead near Manchester. The group already owns long-established waste management brands such as hazardous waste recovery experts Lanstar, print waste management specialists J & G Environmental and Saxon Recycling, Lloyds Environmental and Oil Monster. 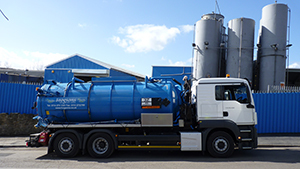 CSG was founded as a one-man sewage collection business in rural Hampshire over 80 years ago, but now employs a national workforce of nearly 500 and is believed to be the industry’s second biggest independent waste manager.